Graham Ensor captured the following sequence of images from Ceduna, Australia, using 200 ASA Fuji slide film, a hand held SLR with 420mm lens and bracketed the shots at 1/250th second. The slides were copied using a Sony Mavica digital camera and cropped and composed in photoshop. Graham says: "The eclipse was at sunset and provided a spectacular display of beads and diamond rings with several prominences...although it only lasted 30 seconds. 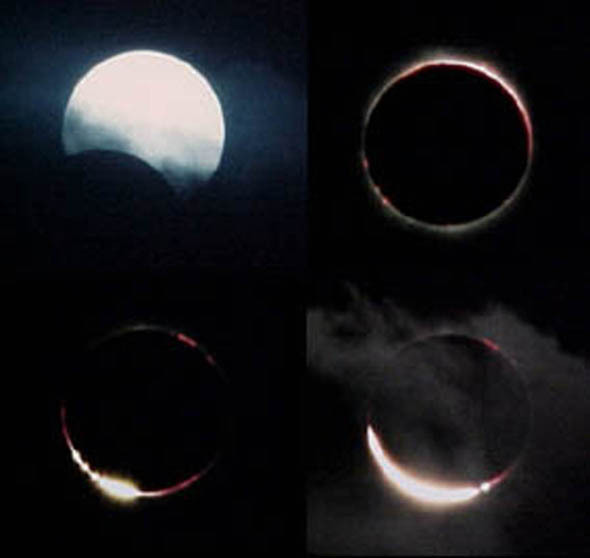 The shots also illustrate the luck we had on the day... the first shows the view as the clouds cleared for the first time all day and the last shows the cloud closing in to hide the sun seconds after totality finished...!!!"